If you’re sick of interrupting your news feed reading to open and load photos, you’ll like a new Facebook mobile site, iOS, and Android app redesign rolling out today that makes photos three times larger. Shares of single photos now look a lot like Instagrams, as they appear full width so there’s less need to stop and open them. Meanwhile the bigger previews of photo albums will help you instantly assess whether to dive in or breeze past. As Facebook’s user base shifts to mobile where it can’t show as many ads as easily, it will need to keep mobile session length and return visit frequency high. Making the news feed less tiring to browse should keep us scrolling for longer as we ravenously peer into the lives of our friends our friends. Here’s the before and after photos…of photos. Reading the news feed on a tiny screen is least exhausting when you can just scroll endlessly. That’s why Facebook recently redesigned the mobile like and comment buttons into a “like bar” so they were accessible from a single click rather than buried behind a “+” button. Instagram never had this problem as its square photos always appear full-size in its mobile feed with no need to open them. Though Facebook announced it would buy Instagram for $1 billion that deal still hasn’t been made official by the Federal Trade Commission. 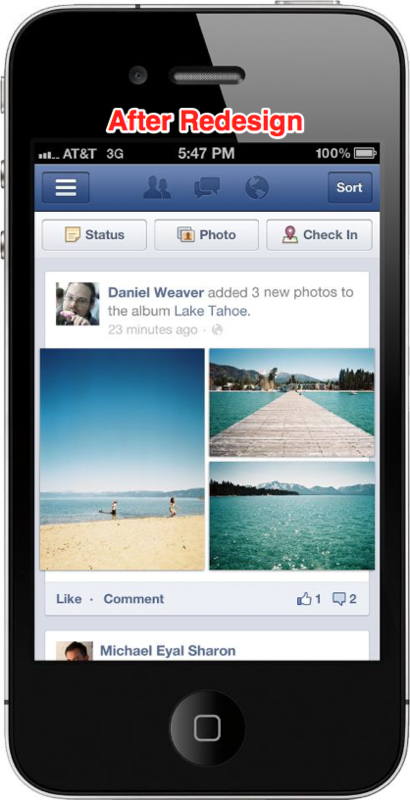 However, it seems Facebook is wasting no time borrowing style notes from its new purchase. 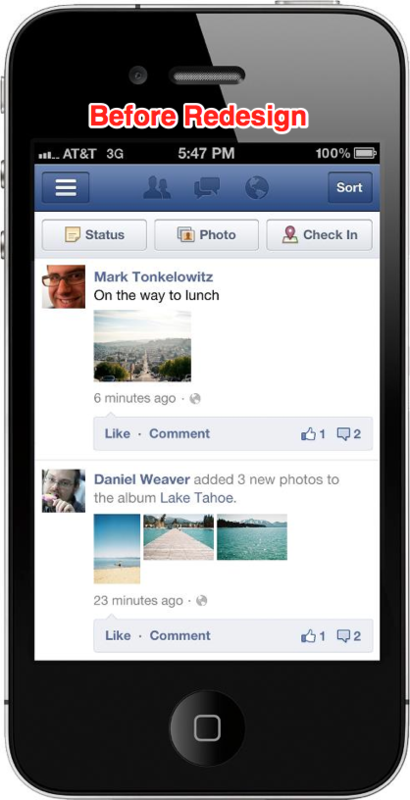 Browsing through near endless streams of photos has always been a huge driver of time on site for Facebook’s web interface. But on mobile where slower connections can stall you from rapidly “nexting” to the next image, you might be reluctant to start viewing an album. Today’s move to a larger three-photo news feed preview could entice more users to start those long viewing sessions of family vacations, birthday parties, and their ex-girlfriends.